Sally Russick of The Studio Sublime is hosting the 2nd year of 'Focusing on Life'; for 2014 Sally is providing a monthly theme, with a more fine-grained focus each week of the month. We have entered April, with its theme 'Moments' ~ I love it! The first week of April our focus should be on 'Morning'. Routine? Unfortunately so much so... The child goes to school Monday to Friday. I go to school Monday to Wednesday, plus the odd extra day (that doesn't mean I party the rest of the time, you know those 'what your mom / friends / family / you think you're doing' pictures? I have an acquaintance who said something along the lines 'so cool, you have so much free time!' err... not really... I am back to a max of 5 hours of sleep a night, but I am full of energy, so no complaints here). Husband goes to work Wednesday, Thursday, Saturday, and Sunday. What does that mean? I get no break, no sleep-in, every single day of the year I am up and ready to run :) Again, no complains, really. So what's my morning routine? Up, get everybody ready, check and reply to business emails, make tea, and dash through the door (or see others dashing through it). When I go to school I get my short ride on the GO bus, and most of the time I read the newspaper, others I chat with my Peruvian driver. 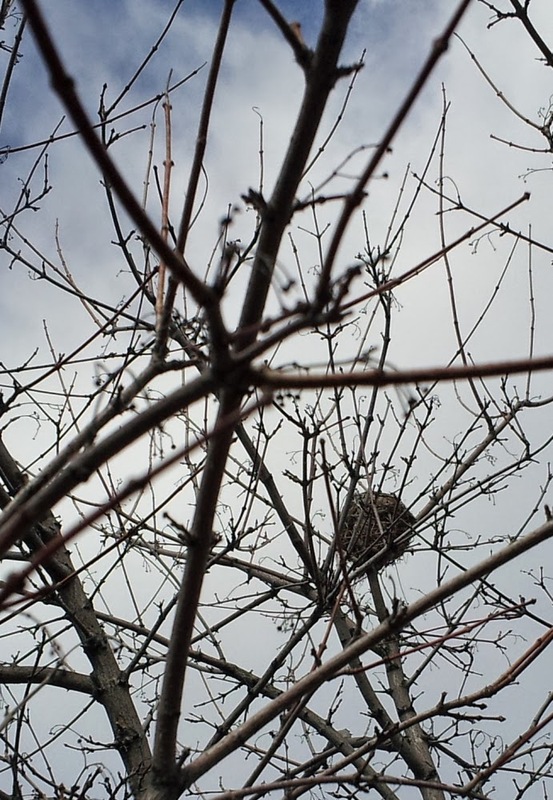 Yes, a cute little nest in a cute little still leafless tree. But I have high hopes I'll see the leaves soon. Maybe the occupants of that little nest too, who knows? This past Sunday I took William with me and since it was very early (long story), and very nice outside, we decided to have a walk through the park. The studio is very close to a beautiful park in Hamilton, Gage Park. Walking back toward the studio my eyes were attracted to a surreal image - it took me a short moment of intense watching to put it in the proper perspective. 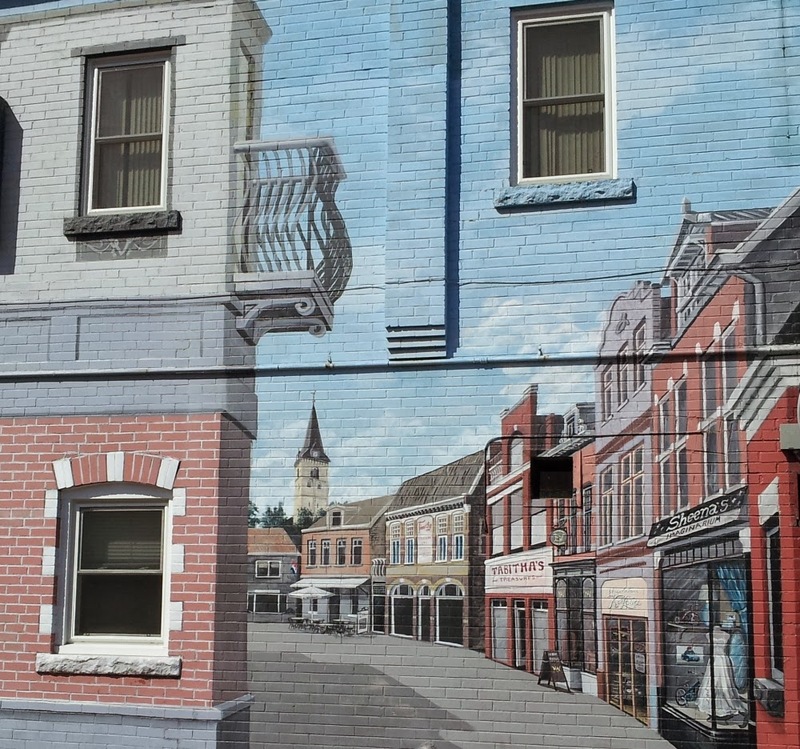 That incredible old Victorian street is *painted* on the side of the building! It is truly amazing and in real life is makes you stop for a moment and watch it intently. Which we did, while chatting about who the artist might be. These are my moments of the week - please make sure you visit everybody else. The theme is lovely and I'm sure we'll find out many adorable moments. P.S. An update on the Lego competition: we had the 'cheer-me-up' ice-cream :) But the kids had fun, worked very well together, used incredible problem-solving skills and enjoyed the day. We all learned valuable lessons, and I have now a clear plan on how to approach the competition next year. Plus a few extra ideas! Your routine seems like a frequent story in modern life. I love the painting. Just great! That painting is wonderful.I too am looking for spring but with another foot of snow yesterday it will be a while. What an awesome painting! I'm glad you took a moment to capture it for us. I miss a lot of things about having kids at home, but those crazy hectic mornings aren't one of them, lol. Mostly because I wasn't a morning person! I'm sorry the kids didn't win but glad it was a good experience for them! What a treat the Hamilton mural is -- very cool. It sure sounds like you have very full days. I'm glad you are able to find some studio time for your creative self. And thanks for the Lego update - it sounds like you are busy with your strategy for next year! 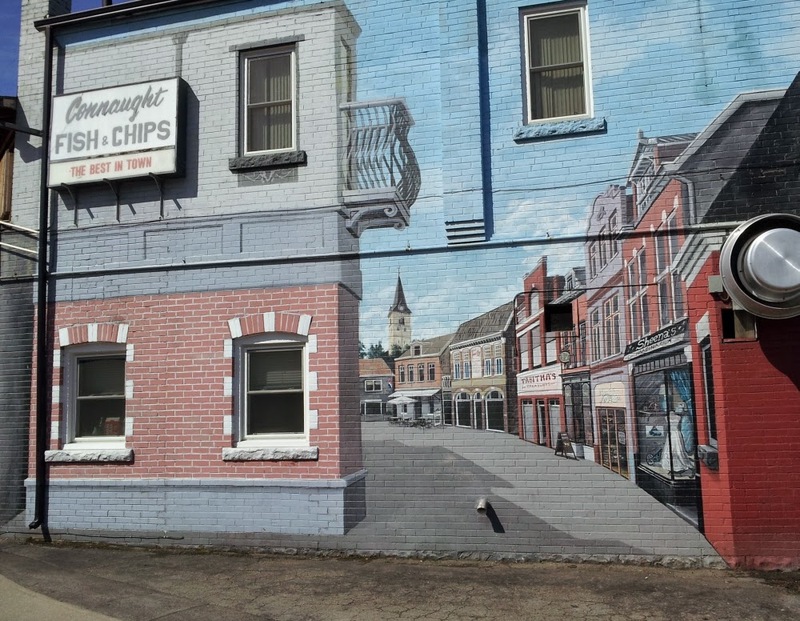 Wow, love the mural.....it almost looks totally real! I wish more places would do this to the stark buildings around town...Would make it more enjoyable!